Can-Am League commissioner Miles Wolff, centre, celebrates the news that the Cuban National Team will embark on a 19-game tour of the Can-Am League. Joining Wolff to make the announcement on March 2 at Ottawa city hall were, left to right, Ottawa Champions outfielder Sébastien Boucher, Aigles assistant general manager Richard Lahaie, Cuban Baseball Federation director Heriberto Suarez, Wolff and Quebec Capitales president Michel Laplante. Ball clubs from Cuba and Japan will be taking the field against the Ottawa Champions this month. “It is a unique experiment and will provide a new opportunity for Can-Am teams and new excitement for fans throughout the league,” says the Ottawa Champions official website. The Can-Am League, which this season started for the Champions on May 19, has seven teams: Ottawa, New Jersey, Rockland, Quebec City, Trois-Rivières, Sussex County and Garden State. 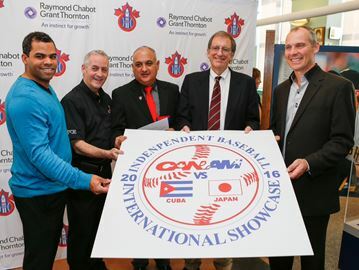 Both the Cuban National Team and the Japanese Shikkou Island League All-Stars will tour this summer to play games against all the teams in the Can-Am League. The Champions will have their turn against the Cubans on June 17-19 at Raymond Chabot Grant Thornton Park. Those games start at 7:05 p.m. on June 17 and June 18, and there will be a 1:35 p.m. start on Sunday, June 19. The Champions will be in tough against the the Cubans, who have three Olympic gold medals and numerous Baseball World Cup titles. The Shikoku Island team will visit Ottawa June 28-30. Those games all start at 7:05 p.m.
As of June 8, the Champions had played 19 games on their season and so far have a losing record of seven wins and 12 losses, which puts them in sixth place in the seven team league. The New Jersey Jackals lead the league with a 14-5 record.